Planning a move can be difficult enough without worrying about locating a reliable mover — we make it easier. While there are plenty of local movers in Maryland, we understand the importance of working with professional and experienced movers. My Guys Moving & Storage is the right company to handle your move, regardless of whether you live in Rockville, Bethesda, Frederick or anywhere in Maryland. We have been serving the area since 2007 by providing not only local moves but also moves throughout the U.S. Whether you are moving into a new home or relocating your business to a new address, give us a call today! Call 301-340-1800 or simply fill out the Free Moving Quote form on this page and One of the Guys will be right with you! In addition to moving your belongings, we can also help you pack them. MY GUYS offers packing supplies, including tape, packing paper, and moving boxes to fit everything from your television to your dishes and your wardrobe. For your local move, you can even rent our wardrobe boxes to use on moving day. Give us a call in advance to order the boxes that you’ll need. We provide the best moving service to our clients and we back it with industry-standard valuation coverage. 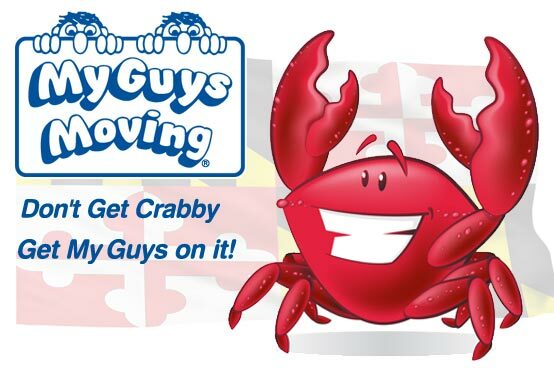 Unlike some moving companies in Maryland, My Guys Moving & Storage takes care of its customers before, during and after the move! Trust a professional moving company in Maryland when moving out of state. Your property needs to be loaded securely in the moving truck, and it also needs to arrive safely and in a timely manner. As an authorized agent for our van line, we give our customers the comfort and confidence that only a leading long distance moving company in Maryland that specializes in safe and reliable moves can provide. Not only are we movers in Maryland, but we also own a secure, temperature-controlled storage facility. If you need to store your belongings, we can keep them secure and safe in our warehouse or we can store them in a local Maryland storage facility that you choose. A benefit of using MY GUYS for your storage needs is that we can pick up and deliver your items to the location of your choice! For seniors, moving can be filled with anxiety, particularly when moving to a senior facility or nursing home. Because this is a sensitive job for most moving companies, Maryland seniors and their families need a company that acknowledges the potential difficulties associated with a senior move. MY GUYS is especially considerate of these times, and works with several transitional services that specialize in helping seniors throughout the moving process. Call our movers in Maryland at 301-340-1800 or simply fill out the Free Moving Quote form on this page and One of the Guys will be right with you! Thanks for contacting MY GUYS!